Earlier this winter I was contacted by Amanda and Dustin Speraw on Instagram. They’re a young couple who recently purchased a school bus to fix up to live in, which is really cool! Amanda wanted to include some handwoven pillows in their decor, and I was only too happy to oblige. Custom work is one of my favorite things - it stretches me and lets me explore new paths in weaving. So I began weaving. I chose warm tones of mustard, paprika, taupe, and brown, as well as creamy whites to tie everything together. Utilizing a mix of chunky fibers and thinner yarns gave some gorgeous texture to these pillows - I couldn’t wait to get them off the loom and sew them up to send! When I had finished, I cut them off the loom, washed them, and stitched them up! They came out so beautifully - I am always a little worried about how pillows might come out, but they turned out lovely. For this runner, I wanted to try something new. I threaded a beautiful antique overshot pattern onto the loom, and began weaving using alpaca, cotton, and some yellow rayon thread for a little golden shine. The pattern was really gratifying to weave - the combination of textures was just wonderful. When I had finished weaving and tying off, I decided to give the runner a bath in this gorgeous wool soap from Twig & Horn. It smells faintly of rosewood, and was a pleasure to use in the sink. It really fluffed out the alpaca fibers and brought everything together beautifully. Thank you for peeking behind the scenes with me! 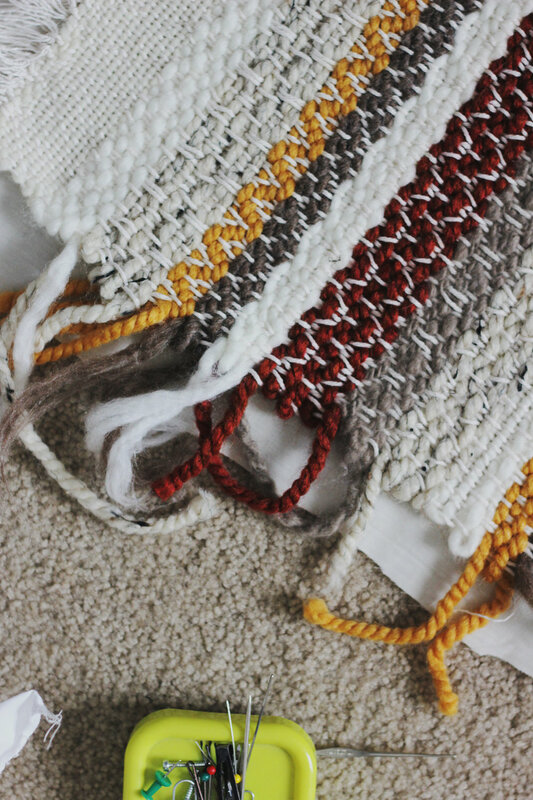 The process of weaving is one that I love sharing. Woven Runner No. 2 is available in the shop.